The 2018 deer and elk harvests were similar to the 2017 numbers in Idaho. Hunters took more mule deer and fewer white-tailed deer in 2018 compared to 2017, while the elk harvest was similar between the two years — dropping by less than 2 percent from 2017 to 2018. The 2018 elk harvest was about 15.4 percent above the 10-year average. White-tailed deer harvest dipped in 2018 compared to 2017, but gains in the mule deer harvest – largely from spike and two-point bucks – brought the overall deer harvest for 2018 above that of 2017. White-tailed deer harvest for 2018 was above the 10-year average, mule deer below, and the combined deer harvest was less than 1 percent below the 10-year average. The past few years have been a great time to be an elk hunter in Idaho; in fact, the current stretch is among the best in the state’s history. In 2018, elk harvest exceeded 20,000 for the fifth straight year. Going back to 1935, only a nine-year run that started in 1988 – the first year in that hunters harvested more than 20,000 elk in the state – and ran through the mid-1990’s ranks higher. Harvest in 2018 was similar to 2017, down by just 426 total elk, or about 2 percent, from 2017. The antlered harvest dropped 325 animals, and the antlerless harvest fell by 101 animals. While lower than the prior year, 2018’s elk harvest was still the third-highest in the last decade, and the tenth-highest all time. Hunters harvested 1,480 more mule deer in 2018 than in 2017, an increase of 5.8 percent. The bump in harvest was a step in the right direction after a 31 percent drop in total harvest from 2016 to 2017. The statewide mule deer harvest in 2018 was about 3.5 percent lower than the 10-year average harvest of 27,969 animals. Leading up to the 2017 hunting season, Idaho’s mule deer population had been on an upswing, but a tough winter across most of Southern Idaho in 2016-17 resulted in the second-lowest statewide fawn survival rate on record, meaning fewer animals were recruited into the herds for the 2017 hunting seasons. Those male fawns would have been two-points, or spikes, in the fall of 2017 had they survived, which typically account for a large portion of the mule deer buck harvest. In response to that harsh winter, Fish and Game wildlife managers cut back on antlerless opportunities to protect breeding-age does and help prime the population for a rebound. Those circumstances resulted in 2,517 fewer antlerless mule deer and 3,709 fewer two points or spikes being harvested in 2017 than 2016. The drop in doe and young buck harvest (spikes and two-points) accounted for more than half of the overall drop in the mule deer harvest in 2017. There wasn’t much of an increase in antlerless harvest in 2018, as most of the protections for breeding-age does remained in place, but there was a bump in the number of young bucks harvested in 2018 compared to 2017 – a result of an average winter across most of the state and a return to average fawn survival rates. This age group of bucks accounted for the majority of the uptick in mule deer harvest numbers from the 2017 to the 2018 season. Hunters took 8,975 bucks with two points or less in 2018, up from 6,562 in 2017 – an increase of 2,413 animals, or 38 percent. Statewide, hunters took 1,368 fewer white-tailed deer in 2018 than they did in 2017, a decrease of about 5.2 percent. Despite the dip, white-tailed deer harvest in 2018 remained above the 10-year average of 24,191 animals harvested. It was the fifth-straight year that harvest exceeded 25,000 white-tailed deer. The all-time harvest record of 30,578 was set in 2015, and the 2018 harvest ranks fifth all time. 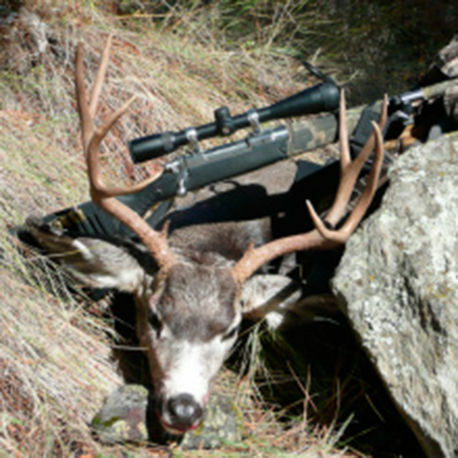 The vast majority of the white-tailed deer harvest occurs in the Northern Idaho. Hunters in the Panhandle region harvested 10,378 animals in 2018, down about 6.4 percent from the 11,084 white-tailed deer harvested in 2017. In the Clearwater region, hunters harvested 12,464 white-tailed deer in 2018, down about 6 percent from the 13,259 animals harvested in 2017. "We can have plus or minus 15 to 20 percent in the harvest annually, due to the weather," said Clay Hickey, Fish and Game's Regional Wildlife Manager in the Clearwater Region. "Last fall was hot and dry, and we would have expected harvest to be down some without a change in hunter numbers." The overall decrease in white-tailed deer harvest was split fairly equally between antlered and antlerless animals: Antlered harvest in 2018 dropped 732 compared with 2017, while antlerless harvest fell by 638. Statewide, the success rate, hunter days, and percentage of five-points remained consistent with 2017.